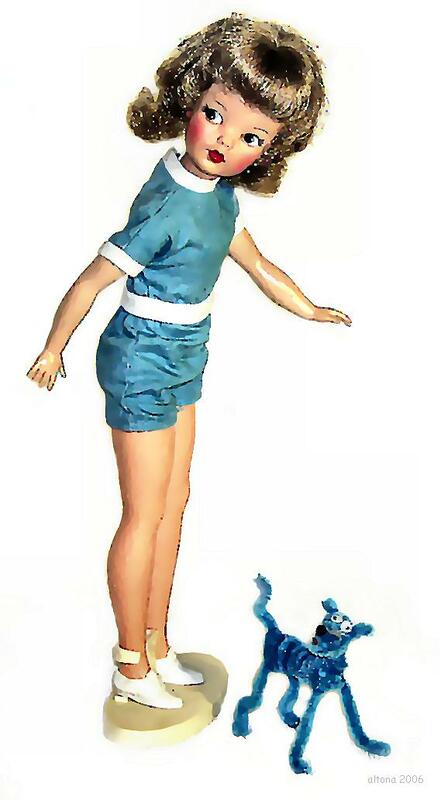 All little girls grow up, and it seems like every girl either packs up her childhood dolls for awhile or gets rid of them entirely. I'm one of those girls that kept as many childhood memories as I could pack and move throughout the course of my life. While I have a variety of dolls, Tammy has always been the Ideal doll for me. I've been charmed with Tammy and her family since childhood when my Mother got me my first one. Tammy looked like a little work of art to me as a child, and still looks like a work of art to me today. My Tammy collection is not complete, nor is it pristine, but mainly consists of old rescued Tammy dolls found in various conditions off and on for the past twenty plus years. My Rescue Tammy dolls are cleaned up, restored, and displayed. I work with each Tammy one at a time, and treat each Tammy as if it were one of a kind. My Tammy rescue mission is a passion. A collection that started with one childhood doll now fills a book case that overflows into the shelves surrounding my vintage Barbie dolls. From tagged outfits to custom ensembles, side by side, the rescued Tammy dolls easily stand toe to toe with any Barbie doll I have - vintage or new - in terms of being a toy of timeless beauty, quality design, and display. A good toy is one that entertains, provokes thought, and encourages a smile. A good toy is also considered precious for its ability to tempt or inspire the heart of a child, igniting the fires of imagination. To me, the Ideal Tammy doll was designed to do just that. You are looking at an artist with the soul of a little girl wanting to share something good with the world. Rescuing an old Ideal Tammy doll and finding it a good home is my one small way of doing just that. 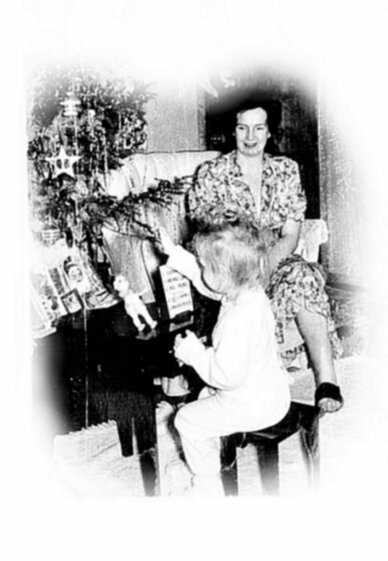 The Christmas picture of my sitting at the toy piano at the age of three with doll and Mother by my side pretty much sums it up. I still love family, and hang the spinner star on the tree at Christmas. My dolls are out and about with many works in progress. As a volunteer co moderator for VikisFinds Yahoo group, my duty is to compose the list of the best one of a kind dolls made by artists who specialize in the art of doll repaint and costume, cloth dolls, porcelain, bisque, resin, cast, papier mache, and other materials used to create a one of a kind work of dimensional art. As a member of eBay's ACEO artists group, I promote the art of ACEO ATC art and artists where ever possible. Promoting the arts and the art of the doll is is what I enjoy doing. VikisFinds Of The Day - OOAK Artist Dolls, Fashion Plate, Doll Blogs, Eye Candy Galore . . .
TV Dolls - Your Favorite OOAK TV Doll Stars In Costume! ©2015 Dolls by Altona -- All Rights Reserved.